I am not left alone in the blackened, fire scorched chaparral on the north-eastern fringe of California’s Thomas Fire. Life is stirring in the wild hills, still partly dark with rain-washed ash, and, where the decomposed sandstone is exposed, oxidized to a sickly orange-brown. The soil is naked and unaccustomed to the light. Closer to roads and houses, where there had been disturbance of the native chaparral, the slopes are an eerily bright green, opportunistically colonized by weedy, European grasses, thistles, mustards and erodium along with the native fire followers, phacelias, acourtia, and soap plant. Other seeds, tubers, bulbs, burls and scorched stumps are restive – quickened by the recent rains. Maricopa lilies, blue dicks, lupin, popcorn flowers and the chaparral yucca are flowering. Laurel sumac, chamise and oaks are sprouting. Wild cucumber is draped over the landscape, twined into charred, skeletal shrubs and emerging from the fissures of heat-cracked rocks. 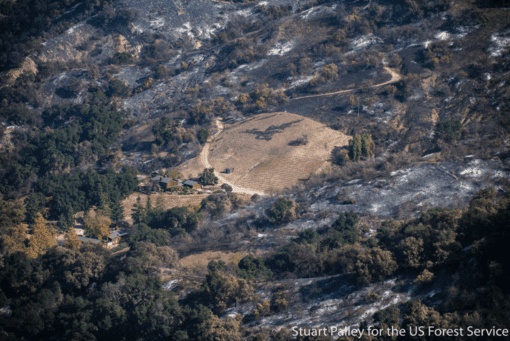 Southern California’s burned mosaic of chaparral plant communities is recovering. Fire is not necessary to its survival, but it is fire adapted. When fire happens it finds ways to continue in the ruins of its mature growth. In Donna Haraway’s words (and the title of her new book) it is, Staying With the Trouble, 2018. Living in the wreckage of a planet ravaged by an exploitative economic system, there may be some comfort in understanding the forms of revival undertaken by these plant communities as possible models for human and nonhuman survival in the sprawling devastation of Modernity. In the last few years we have travelled from earnest discussions over limiting carbon emissions and tinkering with public policy seeking some ameliorative pay-off in the effort to contain global warming to a profound acceptance, (prevalent certainly, within some academic circles), that the unfolding of the sixth extinction, initiated by loss of habitat and the industrial poisoning of land and water and now amplified by the effects of climate change, impacts us all – humans and nonhumans as fellow victims of the struggle to flourish on a critically damaged planet. In this wounded state, the primacy of human consciousness, triumphant through half a millennium of Modernity, is now challenged by our understanding of ourselves as symbionts, crucially dependent on the flourishing of all the organisms that surround, inflect and co-exist with us. she sounds like yesterday’s voice of ‘progressive’ reason; the earnest spokesperson, circa 2014, of what Haraway calls the ‘Great Dithering’ – those years, and now decades, when nothing was done, and is never likely to be done, because the corporate and governmental structures that organize societies in the West are entirely invested in ‘business as usual’ – which, for the last century and a half has run on ‘Fossil Capital’ – Andreas Malm’s term for the spiraling infiltration of cheap, non-renewable energy into the over-heated economies of late Capitalism. Klein’s prescriptions for tinkering with public policy, in 2018, are totally out of touch with any meaningful reality outside of the polite dining rooms of left-leaning coastal elites. In her well-meaning upbraiding of our failed policies, she might also represent one of the many reasons why Donald Trump is our president. He smartly suggested during his campaign, that he, single-handedly, could ‘Make America Great Again’. Amidst this impasse, all some of us now seek is a small corner of the planet that remains fully habitable by the vast panoply of creatures that have come to call it home – and yet, even this, is an almost impossible ask. Klein, the savvy, au-courant journalist, may already have received a much-needed transfusion of the bumptious, incautious, smart, connected wit of Donna Haraway, who declares that we are living in the Chthulucene – her neologism that displaces both Capitalocene and Anthropocene with a word brazenly not ready for any dinner party conversation outside of the far fringes of the Woke. Its etymology derives from a species of spider, Pimoa Cthulhu, which populates the redwood forests close to Haraway’s home and serves as a metaphor for the web-like interactions between human and nonhuman life-forms. Klein piled onto the conventional wisdom that colors the progressive spectrum – Haraway eviscerates it: shredding its apparently thoughtful, constructive policy options into critter litter. Klein uses action infinitives, like ‘to demand’, ‘to reclaim’, ‘to block’, ‘to invest’, ‘to take back’, ‘to remake’ ‘to open’ and ‘to finally respect’, as if she were writing a resume for a gig as a third-string speechwriter with the Democratic National Committee. Haraway uses phrases like ‘speculative fabulation’, ‘multispecies worlding’, ‘Kantian globalizing cosmopolitics’ and ‘grumpy human-exceptionalist Heideggerian’ as if she were writing a resume for a gig as a Distinguished Professor Emerita in the History of Consciousness Department at the University of California, Santa Cruz, a position, as you might have guessed, she secured some years ago. But stay with her, as she stays with the trouble and offers the kind of visioning that entirely outflanks Klein’s ‘steady as she goes’, moderately progressive, business (almost) as usual approach. This Changes Everything sits at number 9,383 on the Amazon sales chart, the much newer, Staying with the Trouble at 30,537. No one ever said changing our worlding practices was going to be popular – just existentially essential. Like Timothy Morton, the object-oriented ontologist with whom Haraway shares a devotion to the work of the French philosopher, Bruno Latour, she pins her hopes on a re-worlding capable of embracing the other-than-human. She calls for a reconceptualization of our gender roles. She embraces the notion of a mind-shift as dramatic as that which characterized the replacement of the Paleolithic with the Neolithic, when scrawled bovine imagery on subterranean caves became the genesis for a testosterone fueled male rampage that gave big-game hunters a hegemonic role within cramped societies and created a model of male hubris that, even today, is scarcely moderated. She deplores the ‘hero’s journey’, what she calls ‘prick history’, and the serial conflations of ‘word’, ‘weapon’ and ‘war’. (In these three words she deflates the pretentious grandiosity of all the religions, many still virulent today, of Karl Jaspers’ ancient, Axial Age). Most who care to be self-reflective, half-heartedly informed by Darwin’s theory of evolution, remain essentially atomistic in their view of the world, still naively confident of our singularity, standing alone as perfected apes, the apex predator. Haraway shows us that we are, instead, ingredients in a biological stew in which we depend for our individual and societal agency on the distinctly nonhuman. Our thriving relies on the thriving of others. We are symbionts within a holobiont. We are situated beings, and Haraway fleshes out the possibilities that exist in our fully living with, in sympoiesis (collective collaboration), nonhuman beings – the animals (which Haraway endearingly calls critters), insects, micro-organisms and bacteria, plants and geological formations that enfold us in their presence. Similarly, Morton provocatively urges solidarity with ‘nonhuman people’. We are cadet Gaians, junior partners in what used to be called the great chain of being. Humility has been forced upon us by circumstance. Sympoiesis is now, Haraway urges, our opportunity. The chaparral plant and insect community employ a variety of strategies to ensure their survival after fire. Long dormant seeds of many species of shrubs and forbs awake to take of advantage of newly available light beneath the absent canopy. Other shrubs and trees sprout from burnt stumps or burls. Insect populations are decimated in the immediate burn area, but replacements quickly arrive from beyond the charred perimeter. Some species of beetles actively seek out the smoldering vegetation and even begin their courtship amidst still burning brush. Chaparral has fluid spatial and temporal boundaries, with disparate generations of the biome reflecting past fire events. Haraway notes that it is the “porous tissues and open edges of damaged but still ongoing living worlds, like planet earth and its denizens” that enable us to consider possibilities for its rehabilitation and sustainability. My concern for the chaparral’s ongoingness opens a portal to what Haraway terms ‘response-ability’. She might even suggest that the plant community in which I am situated, and which is deep within the ambit of my caring, will likely generate some small epigenetic response. In Haraway’s Speculative Fabulation (companion to the other SF’s threaded through her text, such as String Figures, Science Fiction, Speculative Feminism, Science Fact and Science Fantasy) and with which she ends her book, she follows five generations of women, each named Camille, within a renegade North American community dedicated to their co-evolution with the monarch butterfly. She describes these Camille stories as ‘invitations to participate in a kind of genre fiction committed to strengthening ways to propose near futures, possible futures, and implausible but real nows. (Klein, by contrast, does a great job of writing plausible but unreal nows). As a human survivor of the Thomas Fire, I am now embarked on an SF endeavor of my own – Speculative Fortuity. The chaparral is resurgent, my task is to watch over its rehabilitation not in an active or intrusive way (the burnt soil crust crumbles under the pressure of human foot falls – rendering it vulnerable to intrusion by weeds), but in a contemplative manner that privileges the directly observed details of its regrowth over the mediated dramas of a globalized neoliberal society to which my attention is all too often drawn. While I can be certain that the chaparral will long outlive the grotesque final writhings of a moribund and profoundly anthropocentric Modernity, I may or may not live to fully see this iteration of its local restoration – which will progress over the next three or four decades; and I may or may not live to see another fire. But this is the trouble I am resolved to stay with.